“Apple, Inc. (AAPL) in negotiations to acquire Spotify,” read the tip that came in yesterday via email from an anonymous source. Most tips are just outright false, but we dug into this one a little bit. 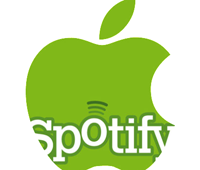 Here’s what we heard – Apple and Spotify are in on-again, off-again discussions about an acquisition, but at best it’s very early in the process. No firm price has been offered, no term sheet tabled. Still, it’s interesting that the two are talking. But way more interesting is this – Last year, around the time that Apple acquired music service Lala, Google and Spotify were deep in acquisition discussions, says a source with knowledge of the negotiations. Ultimately no deal happened, and the two companies tried to negotiate a deal to have Spotify pre-installed on all Android phones instead. But the deal almost happened, says our source, and Google was going to pay nearly $1 billion for the service. Ultimately the deal went sideways because Google was demanding that all label deals be grandfathered in. And Spotify wanted a $800 million+ walk away fee if the deal faltered (Google had a similar provision in their Admob acquisition). Here’s what “grandfathering” label deals means: The deals that music labels do with online music companies contain a provision that if the company is acquired, the deals terminate. That’s exactly what tripped up Facebook when they were looking to acquire or partner with a music startup a few years ago. So if a company like Spotify gets great label deals, like they have in Europe, those deals have to be completely renegotiated if they’re acquired. It ends up making these companies largely un-buyable. So the deal never happened. And Spotify is yet to launch in the U.S. after protracted but fruitless negotiations with U.S. music labels. The service is apparently profitable in Europe based on really attractive deals with labels there. But those five year deals won’t last forever, and will need to be renegotiated soon. What Spotify needs is to launch in the U.S. and soon. Even without a free version.